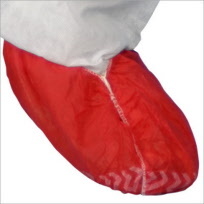 These Shoe Covers have an anti-slip rubber sole and an elasticated cuff to ensure a secure fit around the ankle. They were originally used in salt caves to protect valuable shoes from corrosive salt burns. Their testing in the industrial world proves their resilience and durability. The pack includes 100 disposable non-slip shoe covers , which each measure 45 x 21 cm. They fit shoes up to size 47 (EUR) / 12 (UK). Colours available: Blue, White, Orange and Green.